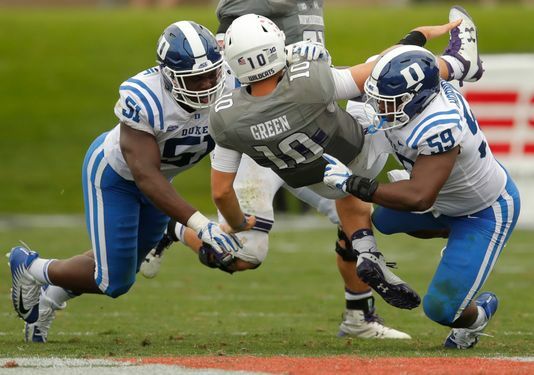 The Duke Blue Devils moved to 2-0 on the season with a 21-7 road win at Northwestern on Saturday afternoon. The Blue Devils gained their fifth consecutive win dating to the Georgia Tech game a season ago. The Blue Devils also snapped the nations longest winning streak where Northwestern had won nine consecutive games. Northwestern jumped out to a 7-0 lead on a Jeremy Larkin run but the Blue Devils would then reel off 21 consecutive points all in the 2nd quarter. Duke scored on three Daniel Jones touchdown passes, the first one going to T.J. Rahming, the second a 51-yard bomb to Jonathan Lloyd and the third a 7-yard toss to a wide-open Davis Koppenhaver. Duke went into the locker room with a 21-7 edge and that is all the scoring that would take place in the game. The Duke defense stopped two Northwestern drives with interceptions by Marquis Waters and Micheal Carter. Their play was key in that Jeremy McDuffie not making the trip and Mark Gilbert going out of the game with an injury earlier int he contest. If that was not enough bad luck on the injury front, Daniel Jones was sacked where his no throwing side was driven into the turf early in the second half. He went to the locker room and would not return. His stat line for the shortened day was 16-22 for 192 yards, 3 touchdowns, and 0 turnovers. The Duke offense stalled time and time again due to bad field position but the Blue Devils defense was up to the challenge. Northwestern had the ball in Duke territory on numerous occasions to start the 2nd half but was turned back every time they threatened. Duke was aided by several quarterback pressures and four sacks on the day. Ben Humphreys led an inspired Duke defense with 5 solo tackles to go with 10 assisted takedowns. The Blue Devils had 22 players play with the stop troops on the day. The Blue Devils did not turn the ball over and their special teams were solid where Austin Parker punted nine times for 42.4-yard average. Duke will head to Baylor for a 3:30 kickoff next week. There is no news on the injury front to report and the NCAA allows team not to share news in that are this season. But judging by the injuries, it is likely that some Duke players will miss some significant time. That means much of the week will be spent on game planning and breaking in new players.